With the jet age came the need to provide a trainer for pilots transitioning to what were new types. The A-4 series was no exception and so good an airframe was it, that the two seat trainer was chosen by the Navy as their advanced jet trainer to replace the T-33B and short lived T2V SeaStar, and later TF-9J Cougar. 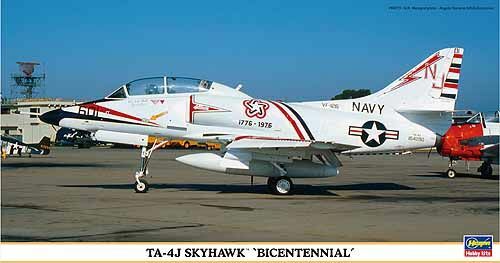 For decades, the TA-4J was a regular Navy addition at air shows around the US. Those living near airports would frequently see these planes on cross country flights and it was chosen by many units for utility work and for aggressor training. The TA-4J outlived its single seat cousin in US military operation by about a decade, finally succumbing to the T-45 that is now in use. Hasegawa has done a few special boxings of this kit, but really, not as many as one might otherwise think. This boxing is from 2010 and includes a rather large decal sheet to cover the special markings of two planes that were fancied up for the US Bicentennial celebration back in 1976. 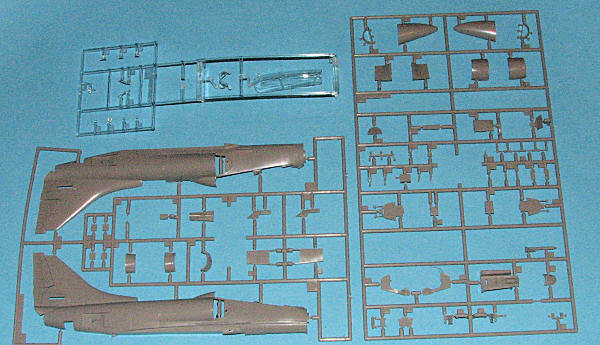 As you might imagine, Hasegawa has chosen to base this kit on their previous A-4E/F by providing one full new sprue and additional inserts to two existing sprues. One of those is the clear canopy and windscreen, while the other is the sprue that normally holds the fuselage halves. The other is an an new sprue that includes the additional pieces for the interior and the nose of the kit. One might be tempted to think that Hasegawa will do an OA-4M, and it could be done, but the canopy, windscreen and canopy attachment area are quite different and would need some additional pieces. Anyway, Karnak the Great doesn't need to be consulted to see that this could be a bonanza of limited reissues, thanks to all the cool aggressor paint schemes worn by this aircraft and the fact that just about every country that flew the Skyhawk had a few two seaters. Then there are the TA-4F Fast FAC versions flown by the Marines. Now as you know, the Hasegawa A-4 series is rife with inserts to do all the versions and so it is with this one. One of the options is shown with armament, and while not at all uncommon, most TA-4Js were either without guns or often had only one fitted. All the other options (flaps, slats, open canopy and so on) that are with the other A-4 boxings are available on this so I won't go over all that again. There is a very large decal sheet with two options. 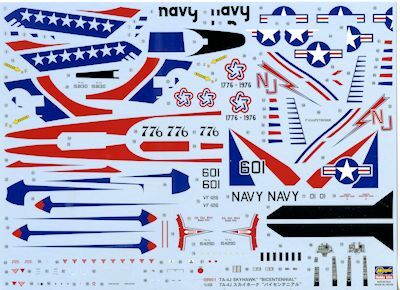 On this sheet are instrument and console decals, wing walk decals and now anti-glare panel decals. Both of the aircraft options are base white over which an extensive decal sui te is placed. The box art plane from VF-126 is to my mind the most fetching and probably the easiest to apply. The other option is much more involved and is the plane from VT-7. Your editor did this scheme in 1/72 many years back using the old Hasegawa 1/72 kit and it turned out well. It was with this model that I learned of the yellowing qualities of Testors gloss clear. Decals are well printed and should provide no surprises. This is a nice kit and has an equally nice pair of special markings options. I'm surprised that this kit isn't built as much as I thought it would. I blame Hasegawa for taking so long to release it as I'm sure that had they done so when the aircraft was still in service, they would have sold a great deal more of these. If you would like your product reviewed fairly and quickly, please contactme or see other details in the Note toContributors.